I've been having a devil of a time (get it?) picking which lead female character from Daredevil should go first for SFC Friday, and I'm still not even sure I've made the right choice. But isn't that the best possible problem, here? Between Marci Stahl, Claire Temple, Karen Page, and of course Vanessa Mariana and Madame Gao and Mrs. Cardenas, there are so many badass women on this show it feels almost impossible to pick just one! So I won't. I will eventually cover all of these fantastic ladies, but for now we're going to start with Karen, if for nothing else than because she absolutely terrifies me. I really mean it. 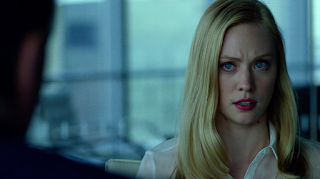 Karen Page (as played by Deborah Ann Woll) is really scary as a character in all the best possible ways. She is also, in my opinion, the driving force behind season one of Daredevil, far beyond Matt or Foggy or even Wilson Fisk. Karen Page is the person calling the shots, it's her crusade that the season hinges on, and it's her character development that we most closely follow. 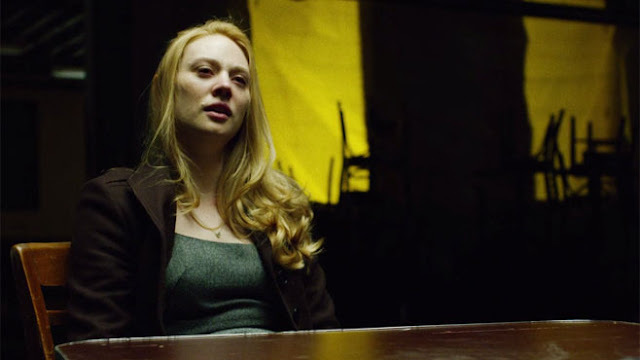 Karen Page is the actual main character of Daredevil, and it's freaking phenomenal. Which is why it was so frustrating when I was talking to a guy at my LCS a few days ago about the show and he told me that he was having trouble getting through it because "that Karen chick is so whiny." I kind of wanted to punch him a little because I honestly can't understand how Daredevil could be half the show it is without Karen. She's the heart and soul. So if he doesn't like Karen because she's "too whiny" and he doesn't like the show because it focuses too much on her, then I'm pretty sure we can't be friends, dude. Karen Page is the sort of character that I always cringe when I see in comics. The plucky, sweet, blonde heroine who you know they really want the hero to fall in love with, but instead he's going to fall for some ethnically ambiguous bad girl. Karen is the ingenue. She's the damsel in distress. And for the first few episodes it looked like she was going to be that on the show as well. A very well characterized and complex damsel, sure, but definitely a damsel and definitely in distress. We meet Karen, after all, when she's been arrested for murder. She's not even actually hired our boys to be her lawyers because she doesn't know they exist and she can't afford an attorney. They take the case pro bono, which is good because Karen is actually innocent. She is accused of killing her coworker, and the prosecution is making it sound like it was over some love affair, but Karen insists it was something else. She's actually a whistleblower on her company, Union Allied, and has discovered they're embezzling money. All of this is pretty standard cop show/superhero show fare. When bad guys show up and try to murder her so that she can't talk, or when a police officer tries to kill her in her cell, we know that Karen is in a lot of distress and that Daredevil will have to save her. Drama! What makes her story slightly more interesting, though, is how it progresses from there. Because while Karen does very effectively blow the whistle on Union Allied and then eventually find her way to working as a secretary for Nelson and Murdock, Attorneys at Law, her story doesn't stop here. With your average female character in this position, once she was introduced that would be it. Over and done with. But not with Karen. Oh no. Instead, Karen starts investigating her old company and the corporation that owns it. She digs deeper and deeper. She gets Matt and Foggy invested in cases they've never heard of because she thinks it might be related. She hides things. She lies. She suffers from a pretty horrible case of PTSD that she tries to keep a lid on around her bosses. She fusses over the boys and cares for them when they're hurt and does secretary stuff, but that is by no means the sum total of her contribution to the story. Karen digs so hard and so deep that she gets herself put on lists. She bands up with Ben Urich, star investigative reporter, to write the story of the century. She does corporate espionage. While Foggy and Matt are sorting out their emotional problems and Matt is off being frustrated at things as Daredevil, Karen is the only one driving the plot forward. 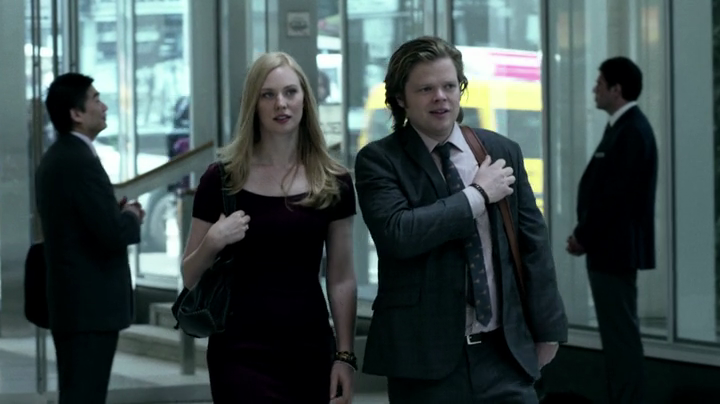 Seriously, I can't stress this enough, there is no takedown of Wilson Fisk without Karen. 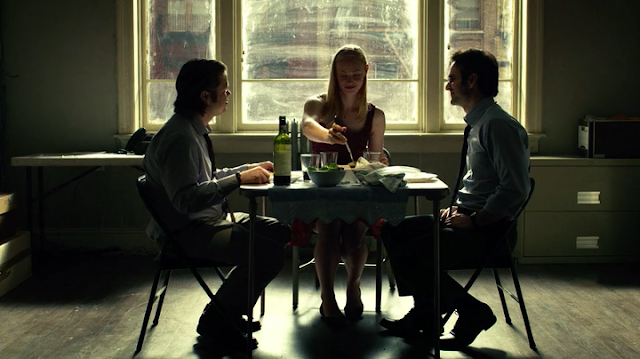 If Karen were just a nice normal girl who looked the other way more often, then Matt Murdock would probably be dead and Hell's Kitchen would be razed to the ground. She is the actual hero of the show, and I'm sick and tired of people saying she's there to just be eye candy. Hell, her crowning moment of badass (and terrifying) ends up being the only real reason that Matt is able to get one up on Fisk at all. After she manages to track down Fisk's mother, visit her in a retirement home, and subtly interrogate her, Fisk's righthand man, Wesley, comes to find her. He wants to know what she knows. He wants her to suffer. In general, it's a pretty by the books scene. Wesley is threatening, Karen is close to tears, etc. But it gets downright shocking when Wesley puts a gun on the table, and instead of backing down and tearfully admitting she can't shoot anyone like the script demands of her, Karen picks up the damn gun and fires six shots into Wesley's chest. I will totally admit that I shrieked when that happened because I was so entirely sure it wouldn't. I was convinced that there was no way that Karen freaking Page would be allowed to take down a bad guy, and certainly not in such a brutal fashion, that it was like my brain was one giant record scratch when it happened. Karen Page is a badass and she is terrifying. She's even more scary because in that moment she implies that she'd shot someone before, and then she seems really comfortable covering the crime up. Not only that but as the season progresses, Karen doesn't actually tell anyone what she did. No one knows. Karen is the sweet, pretty, blonde secretary with an apparent penchant for murder and designer dresses. She's so nosy she nearly gets herself killed, but it's not presented as "oh there goes that plucky secretary again", it's shown to be more like "Karen is going to single-handedly destroy a criminal empire using paperwork." But if I have to name the number one reason why Karen is kind of the best thing ever, it's this: she cries. Like, she does all these things, she kills someone and she delivers devastating exposes and she is super competent sometimes, but she also cries. She cries and she has panic attacks in the night and she doesn't let it be a source of weakness. She doesn't call her fear or her sadness weak. She calls it what it is, and that is necessary. There's this idea in our culture that a strong person doesn't cry, and frankly it's complete crap. It's even worse when people try to assert that what makes a strong female character strong is that she pushes down all her emotions. That's not true. Pushing down your emotions makes you much more likely to burst forth with them at inappropriate times, let's be real, while being honest with your emotions is a good way to make sure you know exactly who you are and what you're capable of. Karen Page knows who she is. It's unclear whether or not she likes that, but she definitely knows. She knows what she's capable of, and so when she cries it's not because she's falling apart, but it's because there are too many feelings inside her and some of them are leaking out. That's why everyone cries, and it's refreshing to see a female character allowed to do it. I would be remiss if I let you go without pointing out as well that there's something so nice in how Karen isn't forced into being a love interest by the show. Don't get me wrong, I know there are little simmerings there, ideas that she could be into Foggy or Matt or kind of both of them, but I like that the show feels comfortable ending the season without making it clear or wrapped up. Feelings are like that, and not every damsel in distress throws herself at her rescuer. It's really sort of funny when I get down to it. 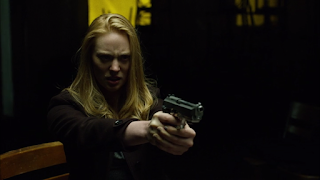 Because the reasons I like Karen Page on Daredevil could just as easily be the reasons I hate her in something else. The deciding factor appears, in all honesty, to simply be the acting and the writing. Nothing else. Her character is entirely execution based. I mean, she cries a lot. She gets herself in trouble because she's too nosy. She's a spunky secretary. She's a damsel in distress who has to be saved. She suddenly takes a level in badass at one point and then never tells anyone. She's "damaged". On any other show, with any lesser writing, I would loathe her for being an encapsulation of all the traits that writers use to make women out as inferior. But I can't hate Karen Page. She's amazing. She's amazing because the writers and Deborah Ann Woll took those characteristics, those seemingly sexist storylines, and forged them into a person. Karen Page isn't just a strong female character, she's a strong woman. She feels real. That's why I love her. Because real women are allowed to be complex and contradictory and not all neat and tidy. And so is she. Have you tried watching "The Fosters"? Karen is the sweet, pretty, blonde secretary with an apparent penchant for murder and designer dresses. She's so nosy she nearly gets herself killed, but it's not presented as "oh there goes that plucky secretary again", it's shown to be more like "Karen is going to single-handedly destroy a criminal empire using paperwork." Well, she's not *stupidly* daring - she dares, sure, but she knows entirely how much of a risk she's taking, but does it anyway because someone has to. When Captain America does that to Nazi-legacied paramilitary conspiracies, it's accepted as heroic. So it is here. Like, she does all these things, she kills someone and she delivers devastating exposes and she is super competent sometimes, but she also cries. She cries and she has panic attacks in the night and she doesn't let it be a source of weakness. I liked that focus was put soundly on her when it came to Wesley. In sequence, we got a reaction shot, her quick cover up, her getting home, collapsing and drinking, and her nightmare (as well as seeing how far down that bottle had got) without anyone else intruding. The deciding factor appears, in all honesty, to simply be the acting and the writing. Nothing else. Her character is entirely execution based. I've remarked from time to time, that the changes needed to make a good female character, or a feminist story, are often not all that big. Like, one scene that was cut from Thor 2 could have changed a lot about the treatment of both Jane and Frigga. One reference to a place Hope really needed to be - and no one else could fill in for - could have justified Scott being in the Ant Suit rather than her. Here we've finally got a positive version of that. Exactly. Karen is brave and it's shown as bravery. It's not sheer dumb luck of a woman "getting herself into trouble". It's guts and it's just as important as all the other plotlines on the show. Which is fantastic. The framing of the murder is probably one of the best done parts of the series. From the get-go Karen is the agent in all of it. She's the one who did something that got Wesley onto her. She's the one who picks up the gun and shoots him. She's the one who destroys evidence. And she's the one whose emotional state we focus on. No quick cuts to Wesley's crying children or to her mourning his life or anything like that. Nope. All Karen all the time. It really frustrates me how much of the sexism in Hollywood is actually just execution based. Like, if you bothered to frame this in terms of the female characters, it would be fine. But you didn't, and so it's horribly sexist. I've had a chance to see the first few episodes of season 2 now - the Punisher arc and a bit - and am still loving Karen. Especially interesting is the way she sees herself in Frank Castle, and is now trying to prove he's like her, because it's better than her being like him (if that makes sense). Plus it's an interesting way for her to still be affected by killing Wesley. (And it's refreshing to see a character like the Punisher being used to further the arc of a character like Karen).